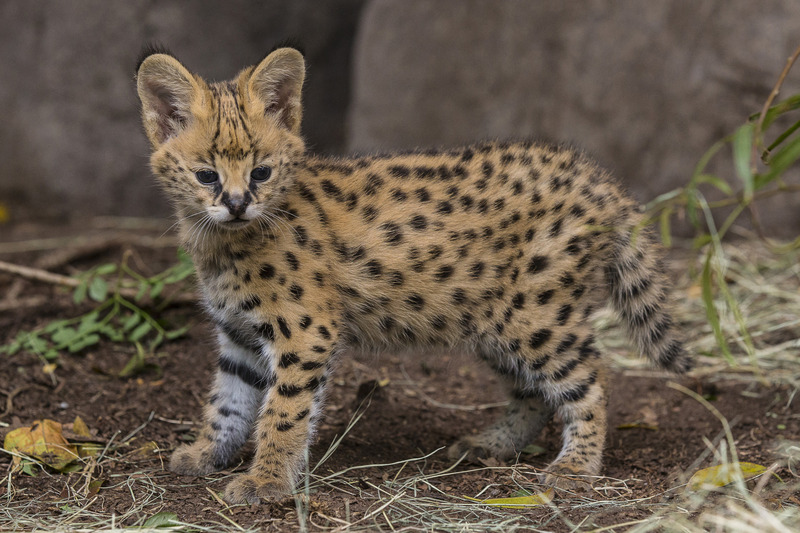 A 5-week-old African serval kitten and her mother are now on display at the San Diego Zoo. The unnamed kitten was born Oct. 7 to first-time mother Onshe. Serval cats are small, slender felines with long legs, a lean body, short tail and small head. They are found primarily in the Sahara Desert near waterways, and in the savanna and forests. The kitten weighed in at 3 pounds during a weekly check Thursday, according to the zoo. “The activity that we did this morning, getting a body weight on the kitten, is important for us to not only collect information for the future but also to get an idea of how the kitten is growing and his status as he gets bigger,” said Lisa Martin, animal care supervisor at the San Diego Zoo. Zoo officials said the kitten is very curious of his surroundings and is getting more confident exploring his Kopje area exhibit, which features rock outcroppings, various plants and tree limbs to climb on. The young cat is currently getting all of his nutrition from his mother by nursing, but he has recently begun investigating some solid food items, as well. Onshe was separated from her mate prior to giving birth, because in the wild, serval cat mothers raise their offspring by themselves, according to the zoo.